Got ants? It’s upsetting to find ants crawling over your countertops, coming out of the tiniest crack on your windowsill, or seemingly out of nowhere at all. They make the most of any morsel of food left on your dining room table, and every crumb that’s landed on the ground. Without maintaining an immaculate home, it can be difficult to keep your abode ant-free. So what can you do? Well, first thing’s first, you can give us a call here at Hi-Tech — we specialize in termite control, rodent control, and, of course, ant control. 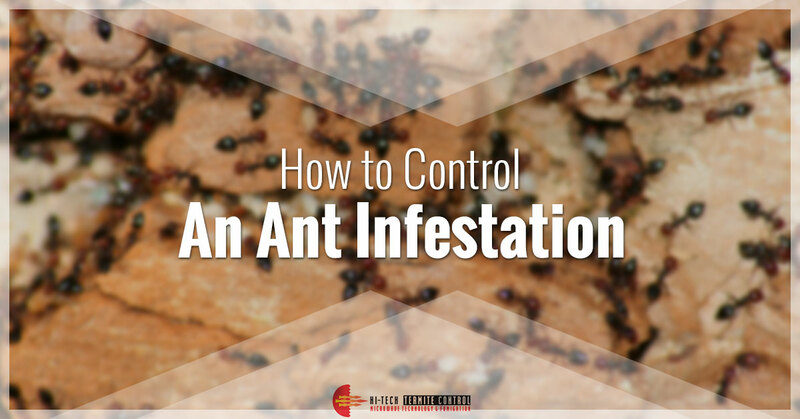 Here are our tactics to ensure that the ants that have made themselves at home vacate your home for good. Our first tactic is to ensure that your entire home repels ants. We’ll use a special chemical formula to create a perimeter around your home in order to keep those pesky pests away. We spray a chemical treatment on the exterior of your home to deter ants from making it to your home’s foundation. Within your home, we’ll strategically place gel baits. Gel baits are designed to attract ants and exterminate them. Ants are attracted to these specialized baits, and they consume and transfer the poisonous gel to other ants in the colony. The poison has a delayed effect, ensuring that ants have time to transfer the gel from ant to ant. After an ant reaches the queen with a bit of gel, the queen will die, and the colony will be eliminated. When ants are already in the walls of your home, gel baits and chemical barriers may not be enough. We can “dust” the walls within your home with a boric acid solution. This insecticide solution is effective at controlling a variety of insects, including ants, cockroaches, fleas, silverfish, and, to some degree, termites. Keep ants well away from your home, and out of your yard with lawn granules. We scatter lawn granules that are a powerful insecticide that won’t affect your grass. We apply a lawn insecticide and then we’ll saturate your lawn, which enables the granules to penetrate your grass. Any ants that crawl through your yard will die off. Rid your home of ants, and keep them out of the house with ant control and extermination services from the professionals here at Hi-Tech. We provide pest control solutions to folks throughout Los Angeles, San Diego, and Orange County, including termite control and rodent control on top of our ant control solutions. If you’re curious about our ant control solutions, don’t hesitate to get in touch with us — we’ll answer your questions. And, if you’re ready to get started, you can schedule a free inspection right here online!